Leticia was introduced to a gasoline powered lifestyle at the age of four through her father. By the time she reached her early teens was competing and commentating professionally in motocross all before she had a licence to drive. While she admits, she was never really a tomboy, always into make up and dressing up as a child, she took to motorcycling naturally. While her father was her mechanic on and off the track, he taught Leticia all the tools she needed to be independent on the road, teaching her how to rebuild motorcycles and maintain cars. Her enthusiasm for riding and mechanics instilled a bond with her father growing up that when he passed 6 years ago, motorcycling came to a halt in Leticia’s life, until more recently. What he encouraged, probably because he saw her strong will and independence early, is the woman she is today. Independant, free spirited and always pushing herself to experience new thresholds, including to date flying planes, sky diving, not to mention her passion for motocross. While she draws the line at base jumping, I suspect this boundary is temporary. As soon as she could drive she was off, leaving notes for her parents to the effect of “off to New York, be back in time for school”, probably well out of her Kentucky borders before they finished reading it. Modelling and motocross came at similar times for Leticia, interestingly both requiring her body to be in top shape but the former more risky and hence requiring her not to ride anywhere but on the track. Understanding and acceptance of either world seemed hard to come by. As a model, few understood how she could put her body at risk, given how much an asset it is to the job. As a rider, her modelling career firmly wedged her into a pigeonhole seemingly hard to shake and hence was not taken seriously despite her ability. Getting back on a motorcycle early in 2014 was no small thing for Leticia. She had to overcome the loss of her father, and make a decision to no longer allow external expectations decide whether she rode or not. After an earlier attempt to ride for a publicity campaign in Canada was followed by intense public scrutiny over her riding ability as a model, she shied away again before working up the courage to ride at a motocross event, and loved it. As she was describing the moment to me it was undeniable her love for riding, that in that moment she realised “this is me” followed by a strong connection to her father. Leticia then took a break from modelling, despite it being her bread and butter, and focused on riding and the motorcycle scene. Today, its rare to see Leticia without a motorcycle. Together with partner-in-life Jason (co-founder of Dime City Cycles) the pair start their day with coffee, end it with whisky and everything in the middle involves motorcycles in some way. Whether it is coordinating travel schedules to moto events around the country, writing about motorbikes and events, wrenching, riding, more wrenching… you get the gist. Leticia also passes on the lessons her father taught her to her 12 year old son who also rides motocross. Between the pair they have a collection of motorcycles all being worked on in some capacity. 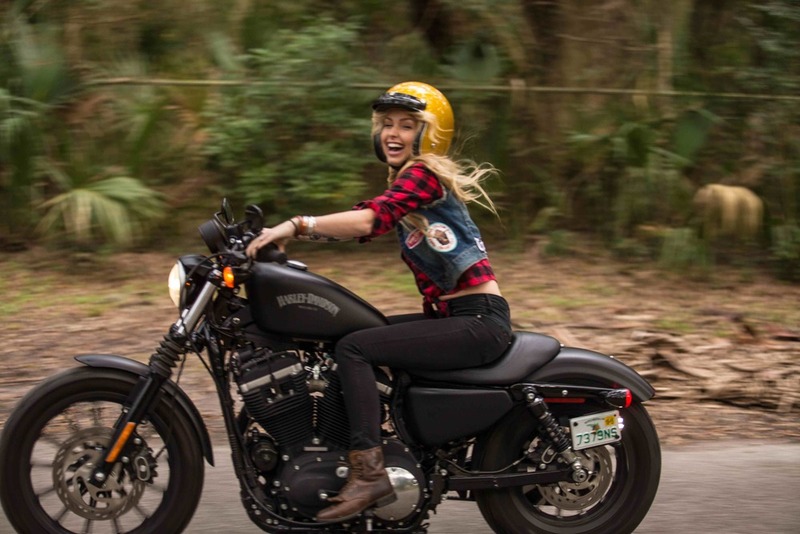 At the moment Leticia shares her riding time between her new Harley-Davidson 2014 Iron 883 Sportster and their Triumph Bonneville scrambler, which she loves for its on-road, off-road versatility. She still has thoughts of attaining a “normal life”, however for someone who is always upping the ante, she admitted that once you experience life a certain way there is no turning back. What I hope comes through is that Leticia is someone who has pushed through threshold after threshold and what followed is a life defined by her, full of what she enjoys and a family (and community) who support it. Leticia is ready to support any other woman who chooses to ride, wrench, drive or fly. A generosity of spirit that only comes from battling expectations herself and coming out the other side authentic.